Velvet is the word used to describe the elk antler before it has started to calcify. In the Orient, velvet has been used for over 2,000 years as a natural remedy for a variety of ailments. In North America velvet is marketed as a dietary supplement. Research promotes the following abilities of velvet antler: reduce inflammation, influence body metabolism, support immune function, protect damaged tissues, and improve blood, liver and kidney function. 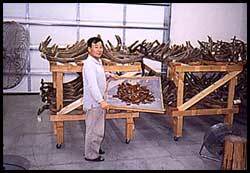 There are numerous old and current studies, articles and manuscripts written about velvet antler. Some of them are available below. It would seem that there is a synergistic balance of the components, as they exist naturally in velvet antler. Although nobody is certain WHY velvet works so well in so many different areas, one of the working theories is that our diets are lacking in the essential nutrients that are needed for our bodies to properly work. Velvet antler supplement gives the body what it needs to work properly, thus allowing it to fix itself. Can I Give This Product to My Pets?